The best torque wrench offers solution to proper tightening. There are critical automotive components that need to adhere specific torque settings. If you over-tighten fasteners like particular lug nuts, you are actually putting those components in eventual wear and damage. On the other hand, too little torque will give your bolt the chance to shear off or dangerously loosen. Either way, it can lead to catastrophic failures that surely puts you at risk. That is why you should now invest in the right torque wrench for you apply the right torque to any component, whenever needed. This is a tool used to apply a certain torque to a fastener (i.e. bolt, nut). First invented by Conrad Bahr in 1918, a torque wrench takes the form of a socket wrench only that it has intricacies inside and special mechanisms that make it work. The first torque wrench is designed to keep the user from over-tightening the bolts of the steam pipe underground. Up to this day, torque wrenches retain its purpose and is now used widely in multiple industries and automotive applications in all scales. A torque wrench is highly important in cases where the tightness of bolts and screws is crucial. It gives its user the ability to apply the required specific torque to the fastener so it can match the specifications needed for it. Now, people can permit proper tension and loading of parts. However, not being able to use the tool will eventually damage the components because of over-tightening. Ultimately, a torque wrench is the most practical way to acquire measurements in terms of tightening bolts and related fasteners. If you’re wondering, a torque wrench has a similar mechanism and purpose with a torque screwdriver. Why Should We Buy A Torque Wrench? While it is so fulfilling to do-it-yourself stuff when it comes to handling automotive issues, there are still some things that are simply beyond our power. Several studies have shown results that people who practice doing automotive things on their own tend to over-tighten just about everything. Even mechanics are guilty of this. It may be the result of natural, careful instinct that tend to do whatever is safe; however, tightening things can actually lead to damaged equipment, stripped threads, and broken bolts. Admit it. We’ve all been there. We really like to fasten things like bolts and spark plugs as tight as possible. It may seem completely harmless at first but problems will start to manifest in the long run. This is where a torque wrench comes into the picture. From now on there are two things that you will need for every operation - the manufacturer’s torque value and the torque wrench in hand. 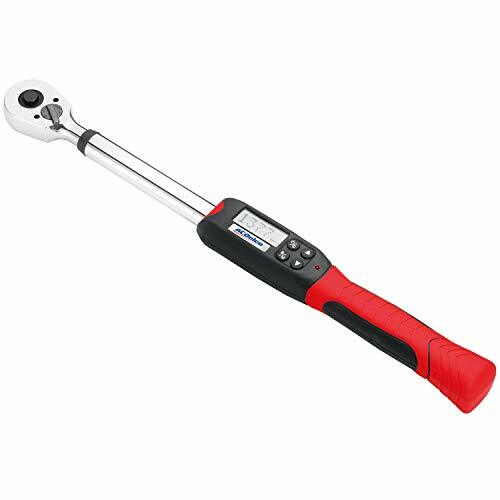 This tool is categorized into three types – beam style wrench, electric, and clicker torque wrench. The beam style wrench has a scale which you can read; and will stop at the right number. An electric torque works with a battery and a digital display. And the clicker type emits an audible click once you attain the set torque. In the old days, a torque wrench is an optional luxury. Today’s advancements lead consumers to ‘need’ the tool for more regular use and not just for the sake of rare purposes. Modern componentry technology need stringent handling when it comes to services and maintenance. People are now patronizing the DIY lifestyle. So tools like a torque wrench can compensate for the lack of actual ‘mechanic’s hand’ when fulfilling a certain job. The beauty of torque wrenches is they can be used across multiple applications; not just for cars. You can have it when repairing bicycles and virtually everything else that concerns bolts and nuts. What Are The Types of Torque Wrench? You already have the basic knowledge about the types of torque wrench, as told just above. This section will elaborate the idea. The micrometer clicker type is a professional-grade tool. You will set the proper torque beforehand as stated in the manufacturer’s torque value of the specific part you intend to tighten. You will then start using the torque wrench and wait until the audible tactile click can be heard. What makes the micrometer ideal is its ability to be highly accurate. You can repeat the process but you need to return the dial to zero first after each use. 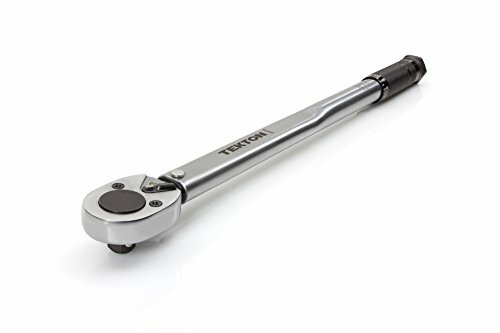 This type of torque wrench requires regular calibration especially if used in some critical parts like internal engine fasteners and suspension. Advancements in technology also paved the way for the development of electronic torque wrenches. This type usually features a digital LCD screen embedded right on the tool itself. It is powered by a set of batteries and is also highly accurate like the clicker type. One thing that makes this one better is it can produce a loud beeping sound after the preset torque is achieved. This promotes better precision because you are immediately notified, making you stop right away. In the clicker type, there are models that emit quite a little sound, almost inaudible in some cases. The only downside of this type is it usually comes with smaller torque capacities. However, nothing beats with how cool this type looks. The third type is the bending beam torque wrench. This type is ideal for people who don’t use a torque wrench every day. This type consists of two major distinctive parts – an ‘unbending pointer beam’ and a ‘large center beam.’ The latter bends as you apply torque while the former will not bend (hence unbending) so you can read the torque directly through the pointer. You will have to use a pair of pliers to calibrate the pointer back to zero. The biggest downside of this type, however, is the accuracy that depends upon your eyes. Your level of sight must be directly above the pointer if you want to read the scale precisely. This makes it hard to use the tool in hard-to-reach places. You are surely here to find the best torque wrench which is cost effective yet durable that you can use it for long period of time. Read on our following section where you will find our top selected torque wrench with the features, pros and cons. You may also find an ultimate buyer’s guide which will help you to find the best torque wrench. Now you can confidently tighten fasteners to accurate specifications with this dual range TEKTON torque wrench from Taiwan. This one is designed for trucks, cars, as well as garden & lawn equipment. This is an effective tool in making sure your parts are suitably secured to how they are supposed to be, preventing damage especially in the long run. This TEKTON is comprised of all-steel construction, implying a highly durable material built for consistent performance and services that can last for years. It has no plastic parts so there’s no aspect that can easily break or wear out. Further, the mechanical design makes it work independently without the aid of any battery. This model belongs to the clicker type; it’s quite easy to use and highly dependable. You just have to dial a preset torque value and start using the wrench. Once the value is reached, you will feel and hear a mechanical click inside, notifying you to stop. The TEKTON torque wrench is something that gives you confidence. It is highly accurate with a precision of +/- 4 percent. You can adhere to the manufacturer’s suggested torque specification without the risk of getting a significant error. That way you can keep any breakage and stressed parts from occurring. The TEKTON can secure your parts conveniently. This one also has a high-contrast dual-range scale that is so easy to see. The details are so clear you can still properly read it even in lowlight. Now this one proves itself as a practical purchase because it comes in a set of three – 1/4”, 3/8”, and 1/2” – the most popular sizes. 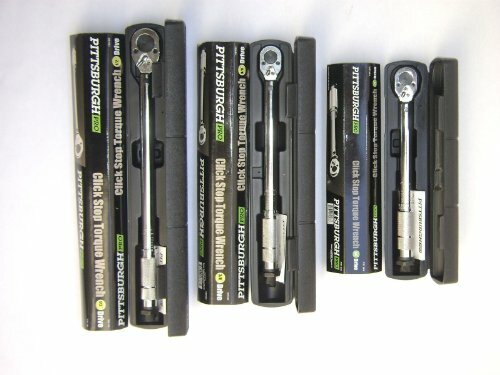 The Pittsburgh Pro is a click type wrench capable of reversible operation. And it doesn’t fall short of accuracy – this one is highly precise at +/- 4 percent. When truthful torque is needed, you can rely in the Pittsburgh Pro. This one is also reversible, meaning you can drive it in both direction with the same expected accuracy. It can still read the dial regardless of the direction you are going. All three of the drives are reversible, come with the same accuracy, and can tackle heavy duty operations. Overall, the Pittsburgh Pro is something you can really depend on whenever lug nuts and related stuff are concerned. The only downside is having no contrast on the chrome. This means you can’t easily read the numbers depending on some factors like the available light in your area. However, the manufacturer is wise enough to engrave or stamp the letters into the metal. This means the numbers will perpetually be there on the tool without any chances of wearing away. 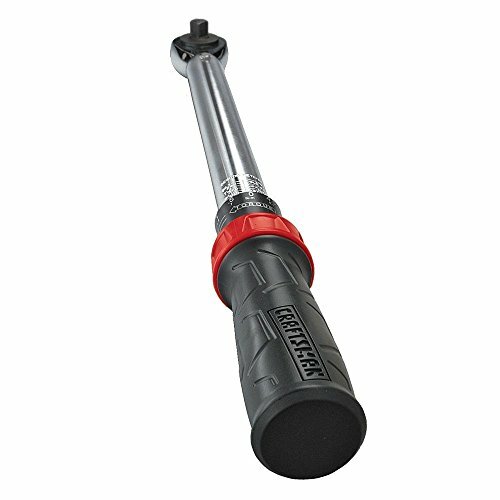 One thing you’ll like about the Craftsman Drive Torque Wrench is it comes with a larger handle that is easy to grip. This one features a twist ring with lock-unlock settings. The first thing that proves this one is of high quality is the brand. It is made by Craftsman, giving you an obvious hint this one is not your ordinary tool. This also explains why the price is a little bit higher than its competitors. And it’s worth every penny spent. The scales show both inch torque settings and its metric counterpart. The best thing about the scale is they are stamped right into the body of the wrench. This means the numbers will not experience an eventual wear; so they will always be there even after years of usage. The best aspect probably is the lock function. It looks cool and works as advertised. The tool firmly locks into place and functions well. Overall, the Craftsman Drive Torque is that humble-looking item in an array of dozens of other similar products, making you almost neglect this one. But this one works wonders, as a lot of owners would agree. Definitely a must-have in your toolbox. Now this one’s something that wants to lead the competition. With all the features the Neiko Pro has, it’s so hard to ignore this one. If you’re looking for something that came with a little bit more length, then this one is ideal for you. This one measures 25 inches long and is built for lifetime use. 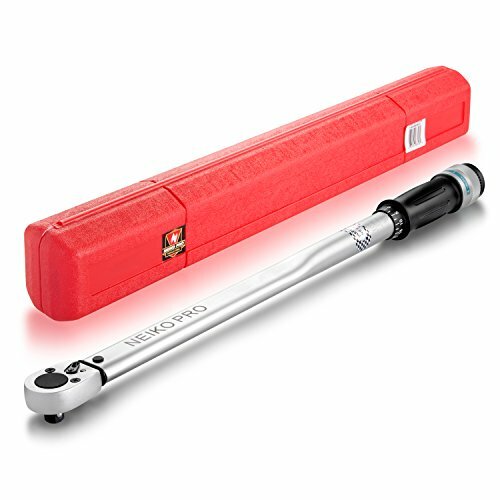 The Neiko Pro is a professional grade 1/2” torque wrench that impressively looks so premium and works imposingly. The manufacturer claims this one can work as a ratchet. It even comes with a wide array of torque settings that will suit your specific bolts and to serve a wider range of small engines as well. This wrench is crafted with precision in mind. It’s guaranteed accurate as machines in the factory calibrated it to +/- 4 percent. Further, it has an embossed steel handle and dial in torque settings. The Neiko Pro is made of Chrome Vanadium Steel, heat-treated to perfection. Another thing that will surely impress you is the range of high and low torque settings that includes settings that are totally hard to find in other competitors. In addition, it gives measurements in both Newton-meter and foot-pound. Now make way for this digital wonder! The ACDelco Torque Wrench features something that you can’t find every day in most torque wrenches on the market – a seamless digital LCD display. There is nothing more precise than seeing the actual measurement on a screen. You can even set the display into the unit of your choice – Kg-cm, ln-lb, Nm, and Ft-lb. From the looks itself, you can tell this one is an advanced tool that is unlike any low-end counterpart. It has an LCD screen with intuitive buttons beside it for easy operation. This ACDelco doesn’t fall short of accuracy between 4 to 99 ft-lb of torque. Further, this one is not your ordinary clicker type – it emits an audible buzzer when the desired torque is attained. Another plus is the anti-slip handle that gives you a convenient and comfortable grip. Another impressive aspect is the fast release feature that saves you time in what you are currently doing. Also, it features a reversible ratchet, making this tool truly versatile and highly efficient at the same time. Since it has an LCD, the unit is powered with three triple-A (AAA) batteries. The manufacturer boasts this one as something designed for the highest form of applications such as military, industrial, and nuclear. If they can be used in such fields, then it can certainly be used in your small-scale automotive DIYs. This CDI is highly accurate from 0 to 150 ft-lb. You’ll surely like how the gauge face looks – it comes in blue. There are basically two needles (active and memory) and you can easily distinguish the two. This one looks so professional and up to the task. You’ve never seen anything as serious-looking as this. This one is built with a robust torsion beam – the secret behind its outstanding accuracy and longer life. Another impressive aspect is the shock-resistant dial. This one retains its accuracy even after some accidental drops, making it truly dependable even for the clumsiest hands. This CDI comes in a fairly small frame; just enough to house everything necessary for it work overall. Its dial is shelled by a sturdy metal guard – the reason it can withstand shocks. The highest torque reading applied is retained by the memory needle. The Industrial Brand CDI Torque Wrench is perfect for someone looking for a high-end torque that justifies its worth. It’s extremely accurate between 30 and 250 ft-lb. And it features a dual scale calibrated for dual direction. 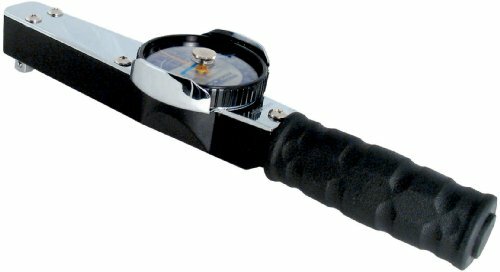 This CDI Torque is an adjustable 1/2-inch drive micrometer torque wrench that comes with positive lock along with a spring loaded pull down lock ring. The wrench is designed with quick release buttons that offer convenient socket removal and great socket retention. This wrench is smartly crafted with laser etched scale. It makes sure the user is able to read the markings easily unlike other types of scale printing/embedding. Further, the torque wrench is so easy to use and works fast. It can handle all tasks within its capacity. The CDI is meticulously engineered to achieve an ergonomic design. It’s not made of some cheap plastic like what you’ll surely thought at first glance but is rather composed of sturdy nylon and rubber. As a result, you have a well-functioning wrench that is so comfortably firm to hold. Overall, the Industrial Brand CDI is ideal for anyone searching for a quality torque wrench with the most solid feel, and can last for longer years. It even comes with a certification of calibration. You now reached the must-read section of the article. It’s always wise to organize your preferences first before directly buying an item. You might possibly end up with the wrong product. You need a comprehensive buying guide that will give you all necessary information for you to make the best purchase decision. What head sizes do you intend to tackle with your torque wrench? Do not end up buying a great torque wrench only to find out it’s not compatible with the head size in question. The head size is a vital factor you should consider when selecting your wrench. The first step you can take is to assess the head size you should need and filter out the options available, leaving you with the choices that make a fit. You can also assess whether your wrench comes with a kit containing a variety of heads. You can find a package or something that comes with the most heads. It’s more convenient to have it this way because you can save tons of money by keeping you from buying another set of torque wrench or a separate head when needed. The size of the wrench is, of course, a crucial factor in its function and usage. The torque wrench size must depend on the kind of project you are going to operate. Are you planning on something small scale? Or do you plan on going for something extensive? Buy something that can handle the job you intend to do. For instance, if you want to keep a torque wrench for lug nuts use, make sure the size of the wrench along with the head size is compatible with the nuts you want to tighten. You can also go for something with a longer length. Scientifically, you will exert less effort in turning the torque wrench if the handle is long. The longer the length, the more your force is amplified, consequently making your job easier. Now this factor must be on everyone’s checklist. Inaccuracy deviates from the essence of having a torque wrench. The purpose of this tool is to provide the right torque to prevent over-tightening the bolts. If the torque wrench is not accurate in the first place, then it’s basically useless. Look for something that is calibrated at +/- 4 percent. It’s a standard accuracy rating. Make sure your item is accurate. There are even products that come with a certificate of calibration - which is a big plus! It’s a guarantee your wrench is calibrated to precision. The wrench type is a decisive factor that defines your life in using the tool. There are actually three types of torque wrench - click type, electronic, and beam torque. The click type makes an audible “click” when you attain the desired torque. You can preset the tool according to the specification of your make and model. This type is also the one preferred by most mechanics. Another type is the electronic torque wrench. Some professionals also prefer the electronic type over the click type because it emits a louder sound, usually a beeping noise, when you’ve achieved the right adjustment. The last type, and the least preferred is the beam torque wrench. Most mechanics don’t recommend using this type at all. Though it may not be the most important factor, the handle still counts. What’s the use of a supposed to be good-performing wrench if you can’t hold it well? Comfort is a vital aspect that you should consider. Make sure the torque wrench is something you can grip well; a handle that doesn’t slip, and something you can comfortably hold. That way, you can work without having to make your hands and arms numb after a period of difficult use. Look for a wrench that features a sturdy, well-built handle. 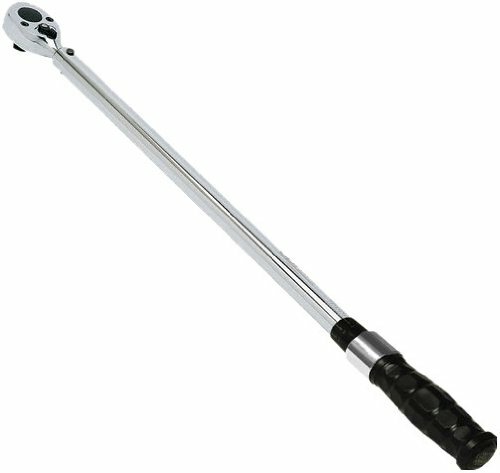 Ultimately, a torque wrench with a comfortable handle allows you to work for extended periods, if necessary. Remember, a good grip must always be on the list of things you should look forward to in a wrench. This little detail often make the biggest issues. If you browse upon hundreds of user reviews, a large fraction of negative feedback is something related about the scale. Basically you need something that is quite easy to read. Whether you have a digital or a mechanical twist, spare yourself the headache of picking something that puts your eyes into stress. You can look for a torque wrench with a laser-etched scale or engraved numbers. That way, the scale will never fade nor experience any discoloration. And they will always be there when you use the tool. Lastly, you should consider how robust the torque wrench is. Look for something built with professional grade material. For instance, you can go for something composed of chrome steel. This type of metal is known for its hardness attribute and high corrosion resistance. Do not settle with some ordinary materials as it will not last for long. You can forgive your torque wrench if it has some plastic parts (like the head and handle) but it shouldn’t be excessive. Find something with the least amount of plastic. How To Take Care of Your Torque Wrench? Your tools also need some maintenance for it to perpetually function properly. A torque wrench for instance also need some tunings. Here are some tips to take care of your torque wrench. Do this before tightening your torque wrench. Clean in a conventional way and do NOT lubricate the tool if not specified by the equipment manufacturer. There are is also a right way to fasten your torque wrench. Tighten fasteners in two steps: first to half torque and then to the final torque. Do not use your torque wrench in applications that it’s not designed to do. The point here is to use a torque wrench as a torque wrench. Further, you can’t also use your torque wrench as a substitute for ratchet (unless specified by the manufacturer). Save the tool only for the final assembly. When you’re done with the thing, it’s important to dial the wrench back to zero. Take note: Never below zero. Just exactly at zero. If possible, carry your torque wrench with kid gloves. Falling it even once can already knock its accuracy off by as much as 30 percent and even more depending on the intensity of the fall. You’ll end up with a tool you cannot rely on. When that happens, have it calibrated back to its normal condition by some calibration firms. You can already use it after. Getting the best torque wrench is indeed an imperative step towards being a responsible car owner. Keep your equipment against eventual wear and start following the right torque according to your manufacturer’s specifications.